The SSBC Kits opened for inspection. I began the process with some online research. 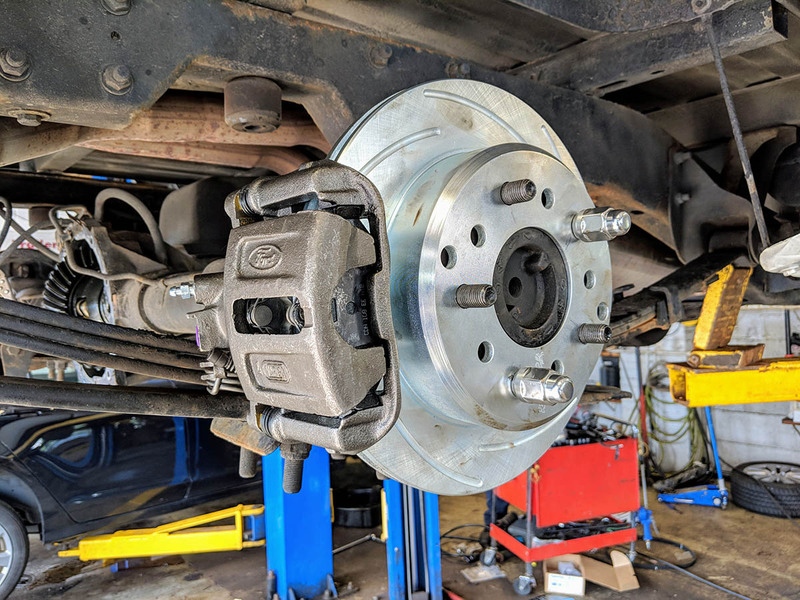 There are a few companies that offer brake upgrade kits for the 1988 – 1999 Chevy/GM trucks. The SSBC kits seemed to get a lot of positive reviews. I placed my first call to SSBC on March 19, 2018, and was connected to Dave. He told me about 2 kits they offer (A126-1 and A126-2) and the differences. He told me that to decide which one I needed, I had to confirm that I had the 10″ rear drums with an axle end flange that had 4 bolt holes. The top 2 bolt holes needed to be 3.5″ c to c, and the distance from the top set of holes to the bottom set of holes (vertically), should be 2.83 ” c to c.
I confirmed these measurements some weeks later and called SSBC to place my order on May 24, 2018. 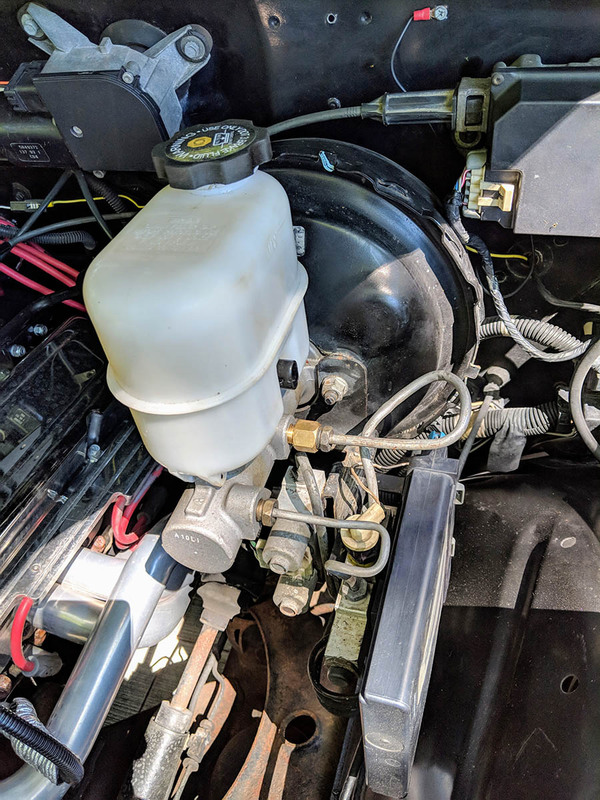 I was connected to Tony in sales who confirmed that I needed kit A126-2 (which includes the “Firm Feel” master cylinder). I also inquired about what options SSBC offered to upgrade my front brakes in a way compatible with the rear brake kit. 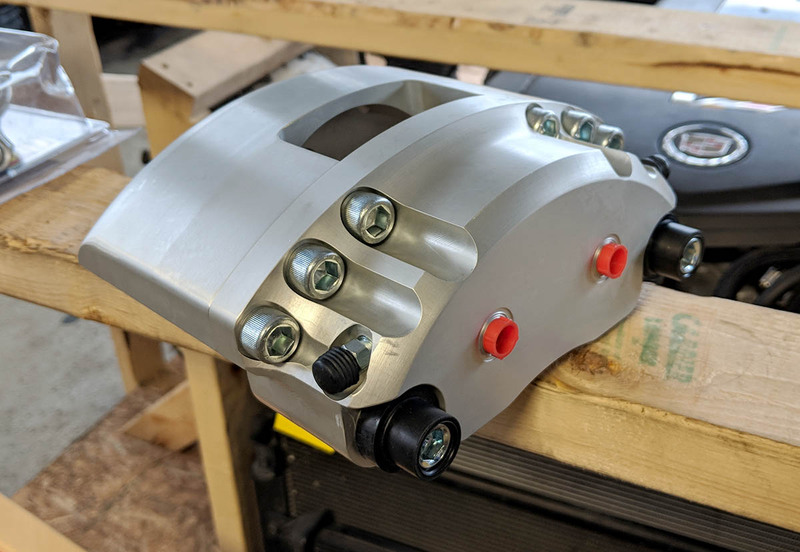 Based on his descriptions and help, I decided to add the A186-1R – SSBC Super Twin TK Quick Change Caliper Upgrade Kits to the order. 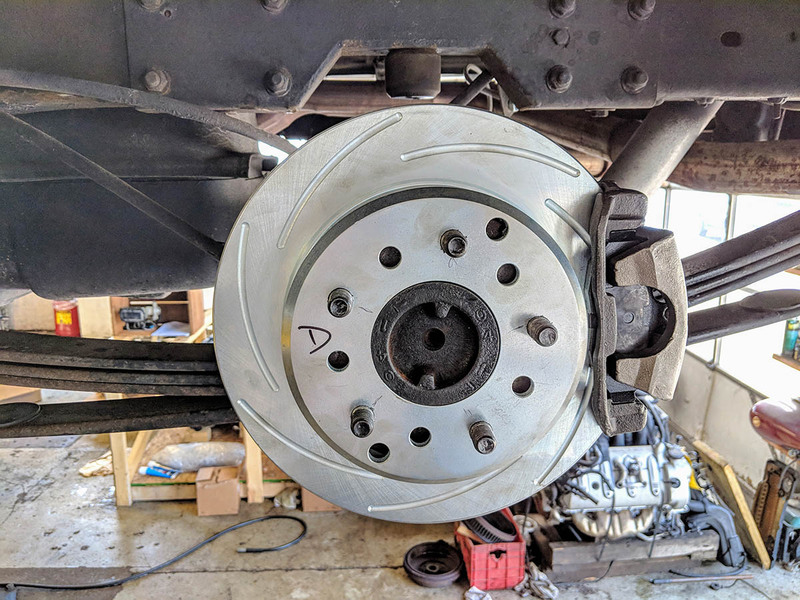 Finally, because I already have slotted rotors on the front of the truck I decided to upgrade the rear rotors in Kit A126-2 as well. I was told that this custom option created a 3-week wait on the order to allow time for those rotors to be made. This meant that the order would be shipped around June 19, 2018. The SSBC rear rotor held next to my rear axle studs. The OD of my studs were 14mm and the ID of the rotor holes were 1/2″. 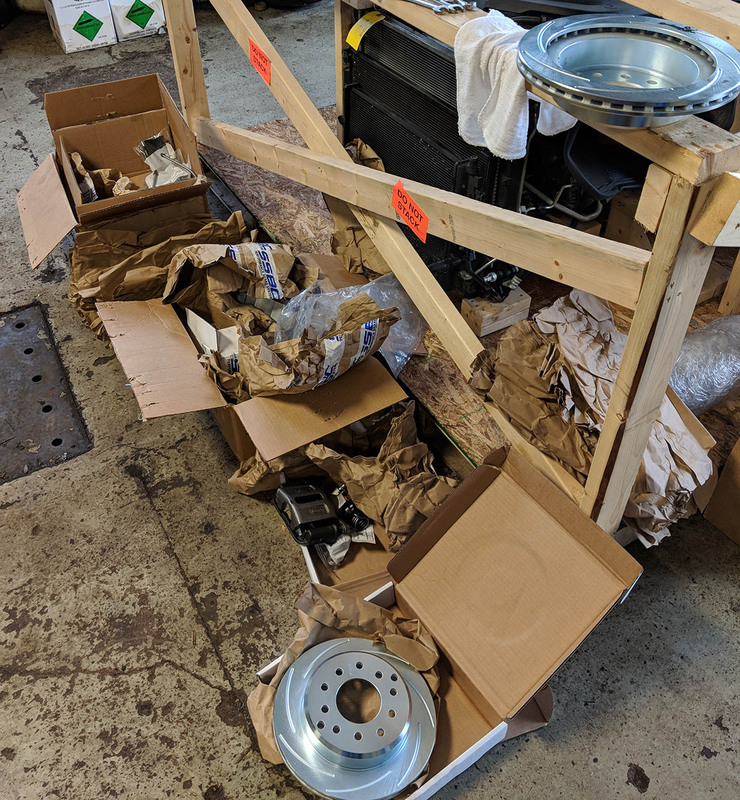 The kits arrived at my mechanic’s shop on June 21, 2018. Based on reported times to do this conversion, I booked 2 days at my mechanic’s shop for June 25-26, 2018. We obtained a $15, 9/16″ dia. titanium drill bit for our drill press and bored out the rotor stud holes without any issues. My axle flange with 4 bolt holes per the measured dimensions. We discover that the SSBC backing bracket holes do not match the holes on my axle flange. 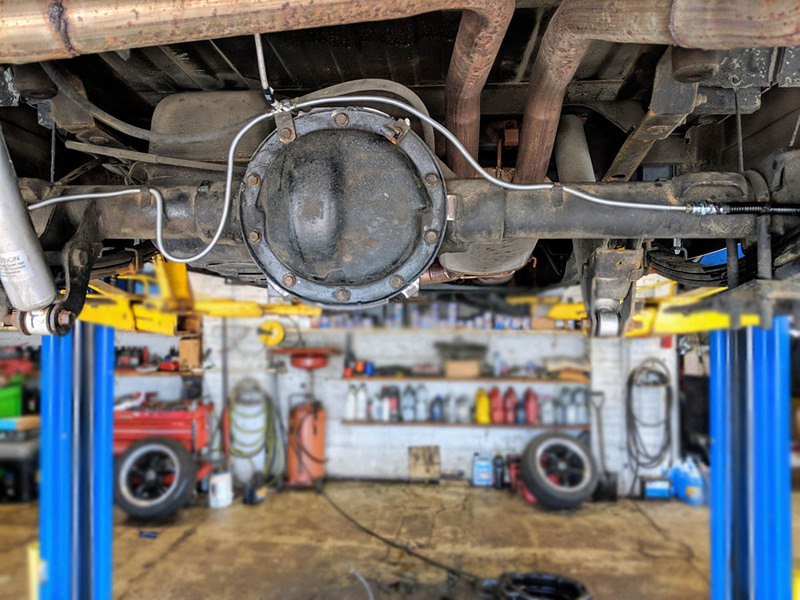 After solving problem #1, the second problem occurred when my mechanic had removed the axle and OEM drum brake and started fitting the new caliper mounting bracket on my OEM axle end flange. Amazingly, the bracket bolt holes did not align with the 4 holes I had measured to confirm what kit I needed! This discovery lead to the 2nd call to SSBC Tech Support where we learned that we had received the WRONG KIT! 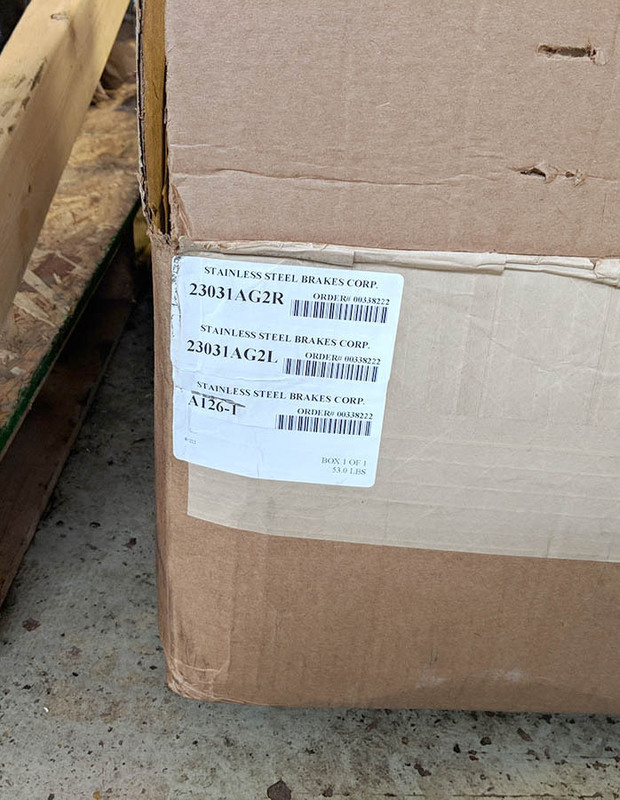 Sure enough, when I checked the shipping boxes more closely, I saw that we had the received kit A126-1 instead of A126-2! 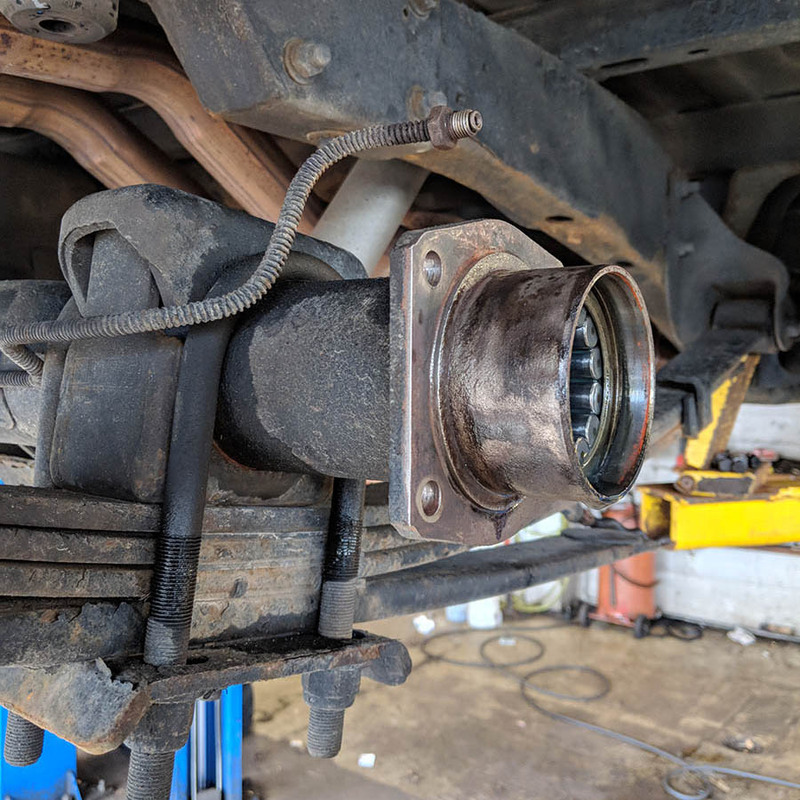 Further inspection revealed we did not have the master brake cylinder, which was to be included. I had waited 3 weeks to finally receive the wrong kit! A really bad initial customer experience! SSBC took responsibility for the mistake and shipped out the necessary parts for kit A126-2 the following day. I had to pay for overnight shipping (!?) to receive those parts on June 28, 2018. Again, not a great customer experience, but I was in a jam because my truck rear end was all apart and on a lift in my mechanic’s shop! The wrong kit is confirmed! 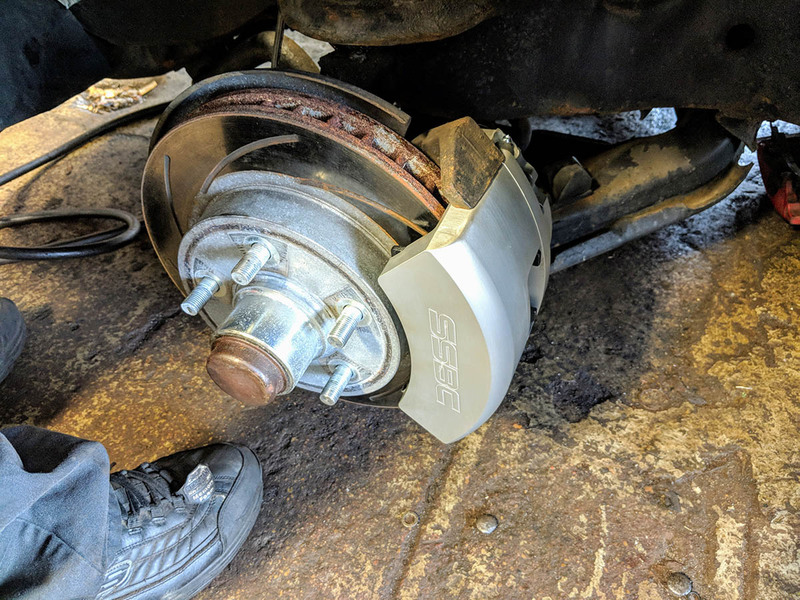 SSBC kit rear calipers – a Ford caliper! So, SSBC agreed to send me the missing parts that I need from Kit A126-2 overnight (I had to pay for the shipping! ), and we are hoping that we can use the same rotors that I drilled out from kit A126-1. The package from SSBC arrived in the early afternoon via Fedex. 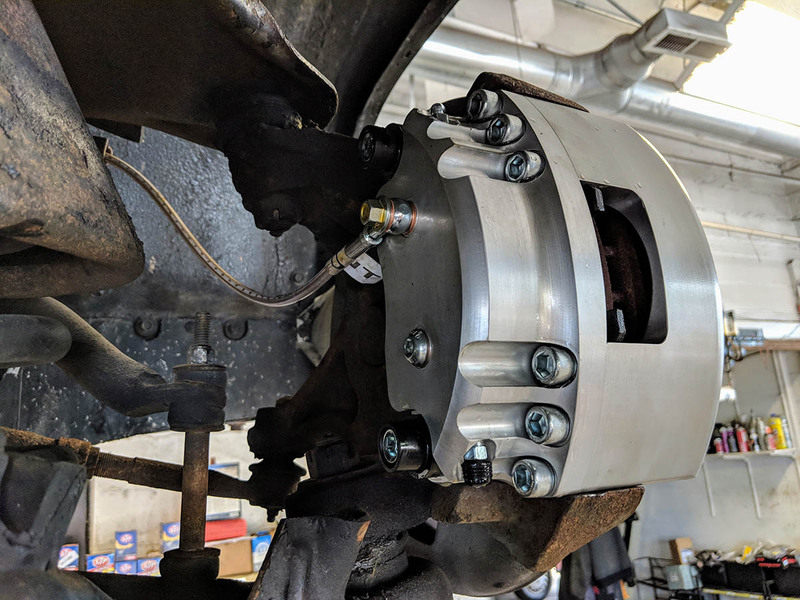 I was able to mockup the right rear brake and ascertain that we appeared to have all the parts needed to complete the project. 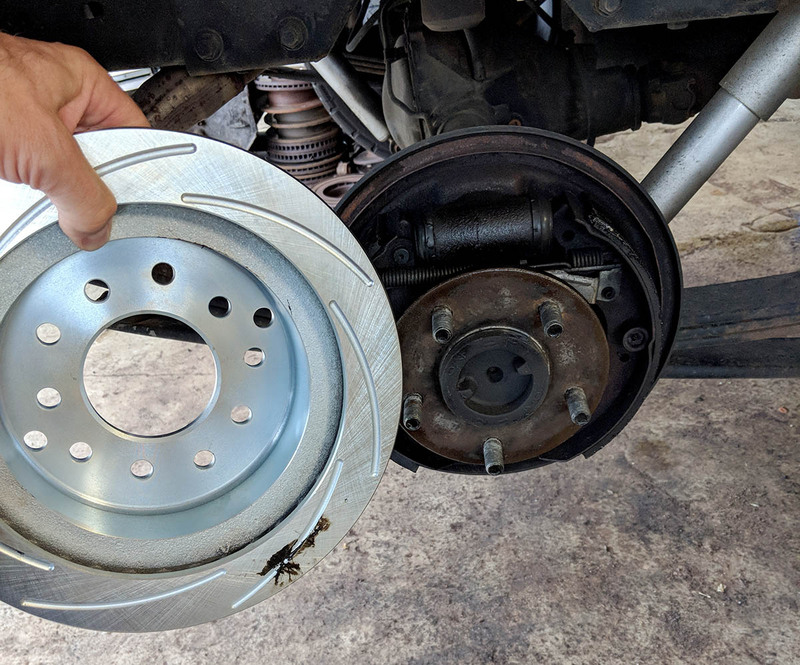 The rotors from the previous kit appear to be a good fit. Mount the rear calipers and rotors and attach the emergency brake cables. Plumb the rear brake lines and hoses. 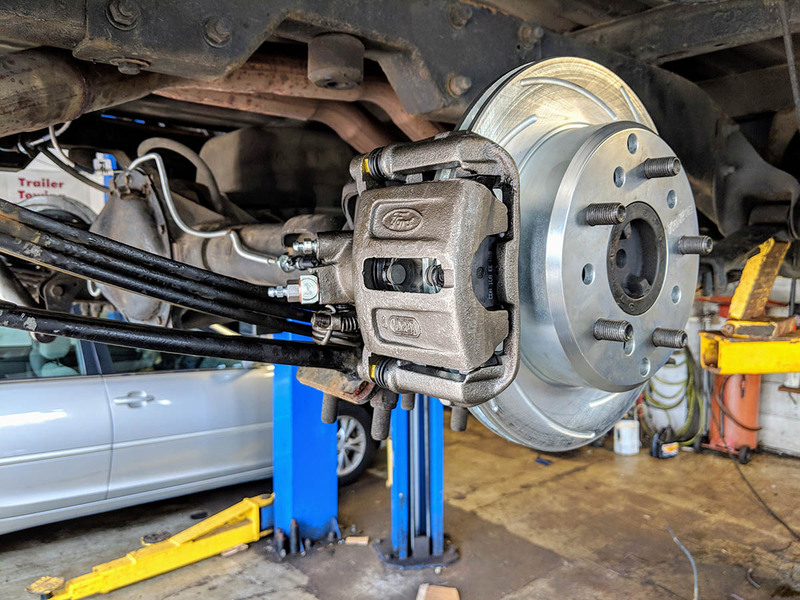 Replace the stock front single piston calipers with the new SSBC double-piston, billet aluminum calipers and add new stainless steel brake hoses. 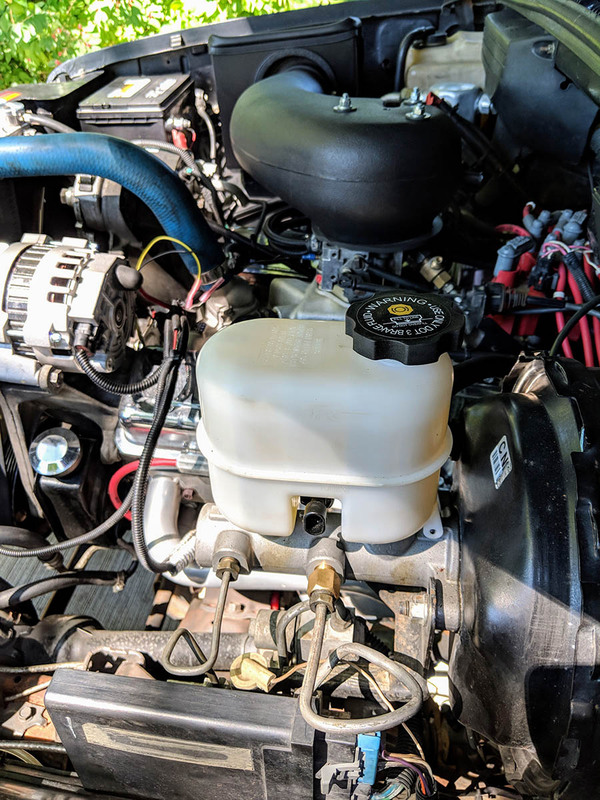 Under the hood, replace the OEM master cylinder with the SSBC “Firm Feel” master cylinder, plumbing the OEM proportioning valve to fit. 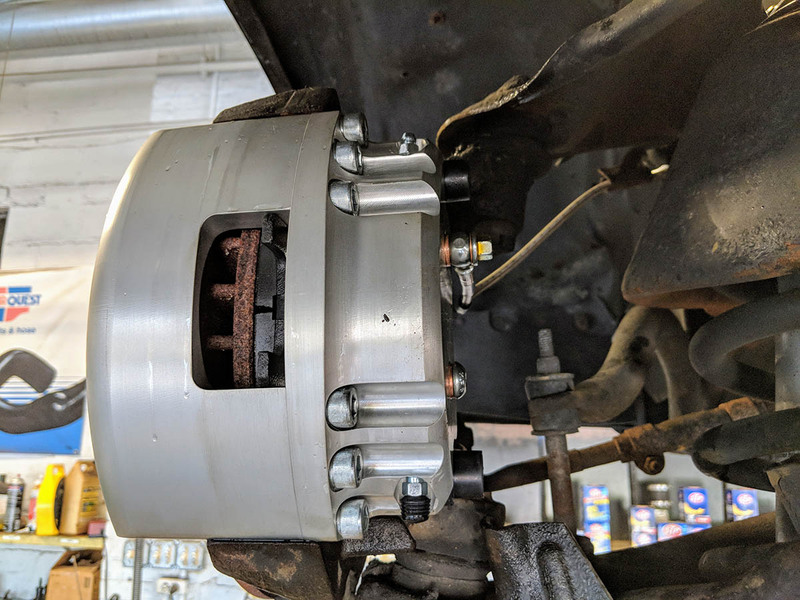 Finally, with my help, the brake lines were bled, tested for leaks, and everything cleaned up before we put the wheels back on and took it for a test drive. 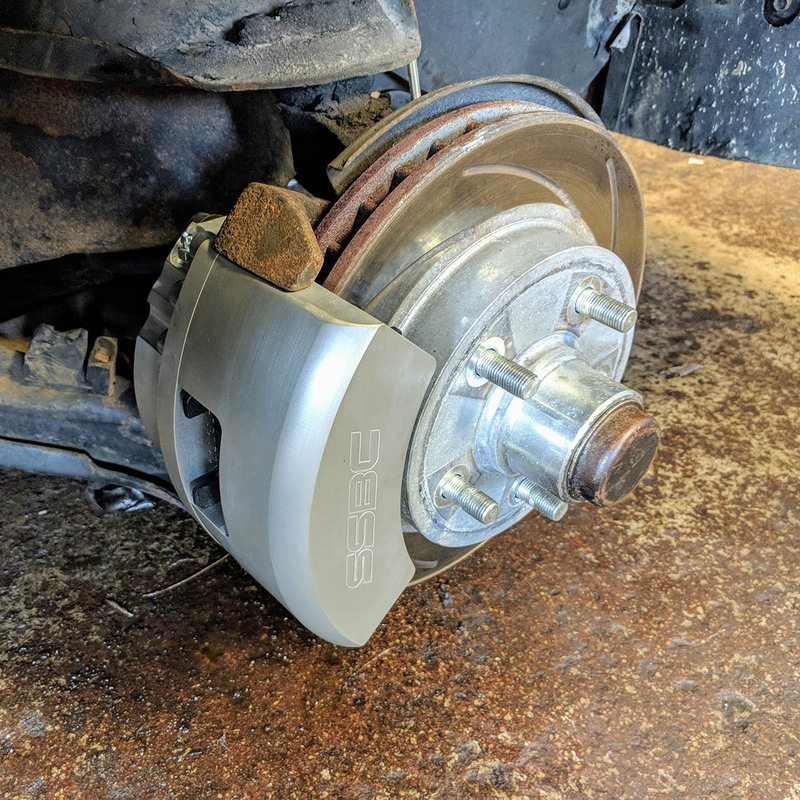 New left front SSBC billet caliper over existing slotted rotors. The new SSBC master cylinder mounted and plumbed on the OEM power booster. A side view of the new SSBC A0463 master cylinder mounted and plumbed on the OEM power booster. The back side of the new SSBC right front caliper. Another view of the new SSBC A0463 master cylinder. 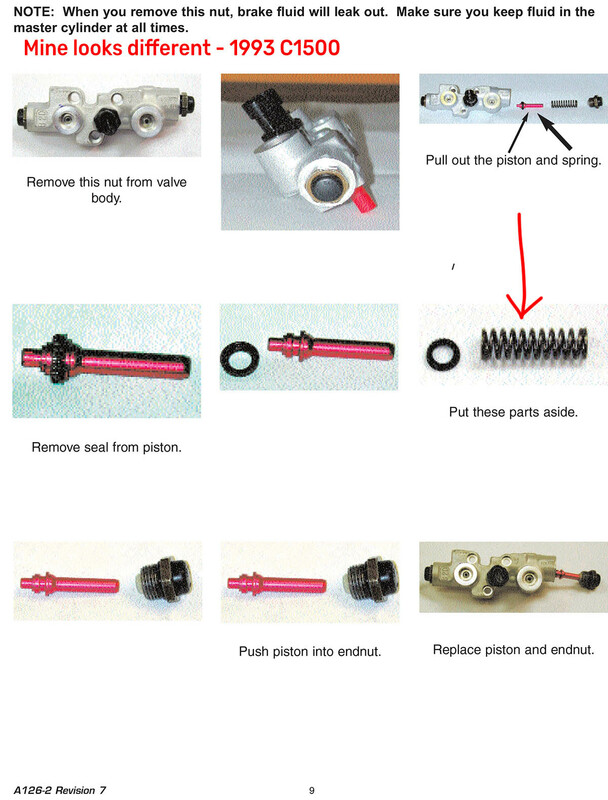 Page 9 of the SSBC Kit Instructions describes removing a piston and then a spring from the OEM proportioning valve. 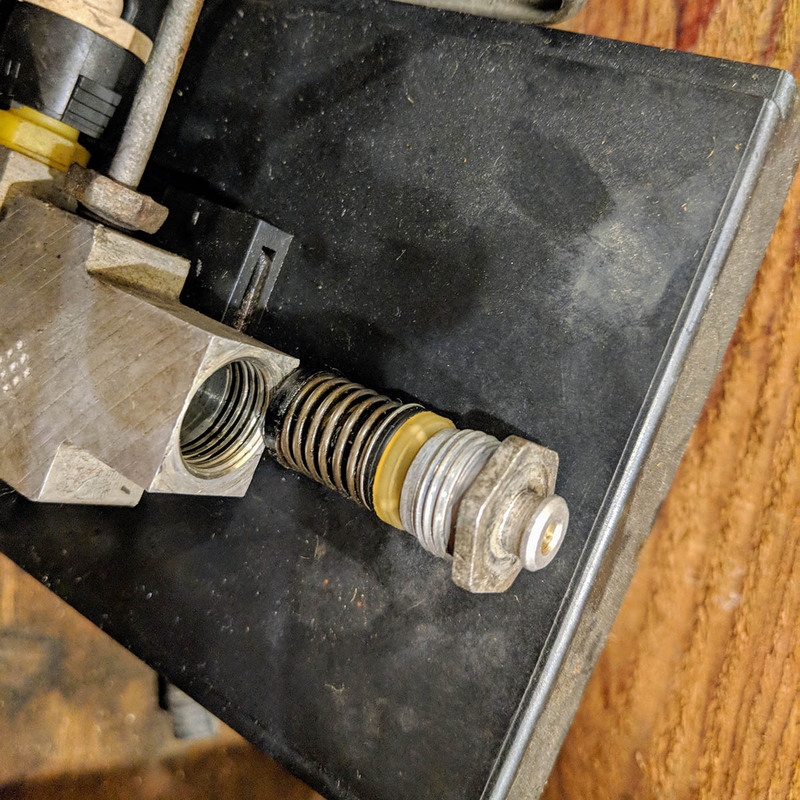 July 2, 2018 – My proportioning valve looks different from the SSBC instructions. 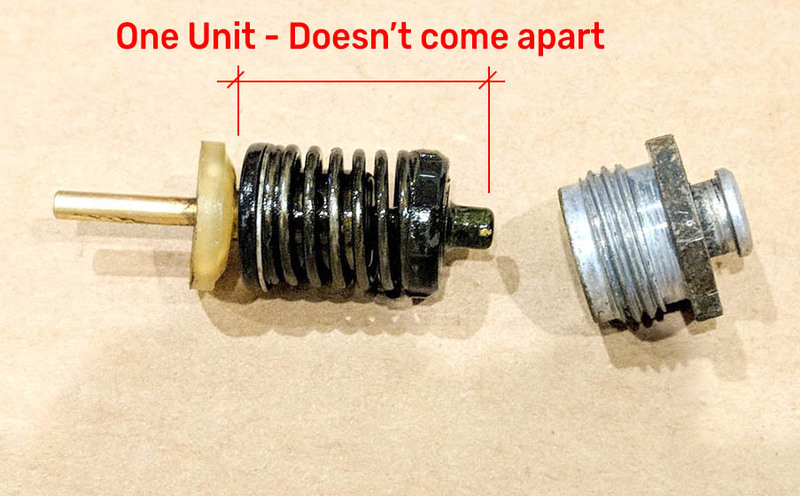 When we pulled off the cap as described on Page 9, there was a nylon washer and a brass center post with a spring and end cap all as one solid unit. It doesn’t come apart like the photos. July 2, 2018 – A closer view of how the prop valve unit came out. After driving the truck for 50 or so miles, I realized that the “firm feel” was not firm at all. In fact, the “feel” was less firm than the stock master cylinder with drum brakes! Obviously, not good! It feels like the rear brakes begin to engage first when pressing the foot pedal down about 1″. It then feels like the front discs engage at about the 2″ mark. I am wondering if this has something to do with the discrepancy we discovered in the master cylinder installation instructions. My OEM master cylinder proportioning valve does not look like the one in the instructions. I sent off an email to SBCC Tech Support to see if they could shed some light on this last remaining issue. 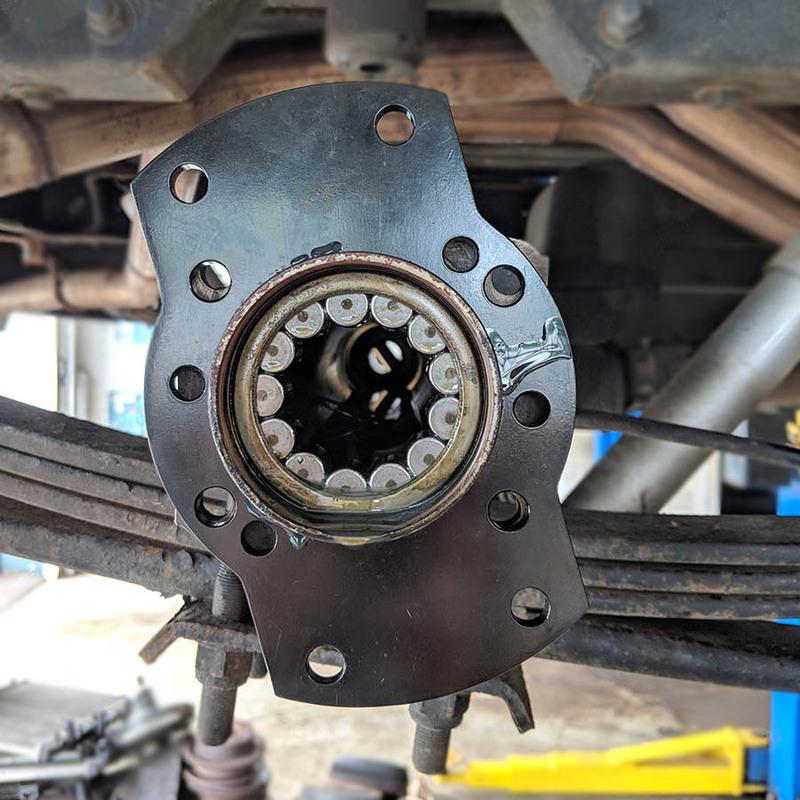 I purchased a pneumatic-powered brake bleeder tool (designed for a one-man operation) and went through the process of bleeding the brakes again (left rear, right rear, right front, left front). This improved the firmness and pedal feel maybe a little bit. 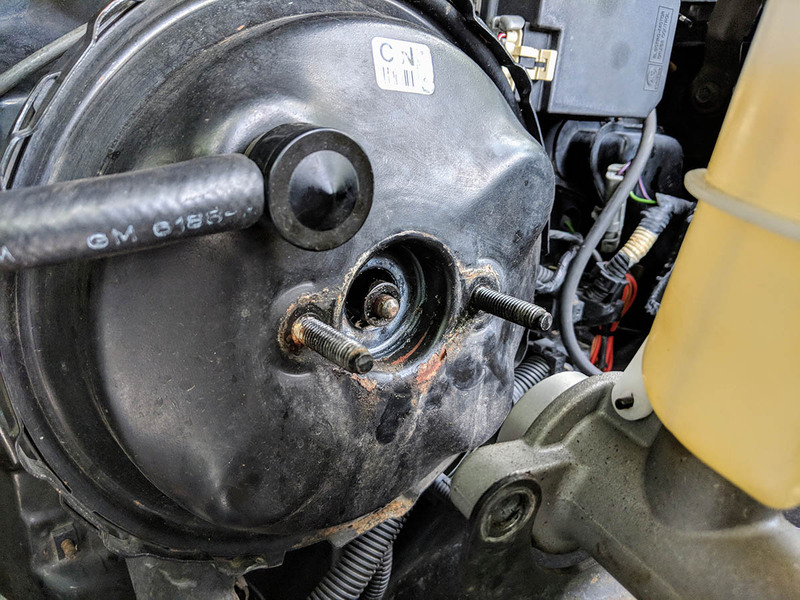 I also pulled the new SSBC “Firm Feel” A0463 master cylinder off of the power booster (2 large nuts on studs) and inspected the push-rod pin in the center to see if there was a way to adjust its length. 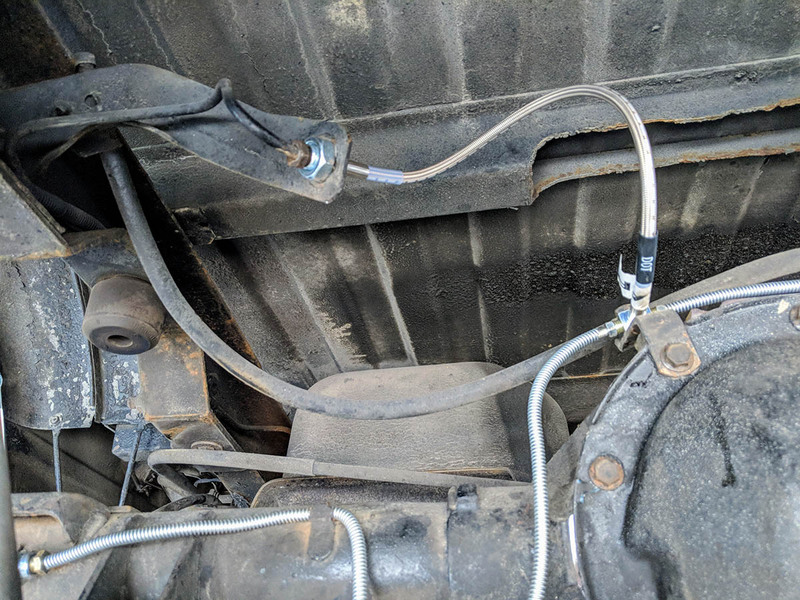 I was told by SSBC that there would be a nut that I could loosen and use to adjust the gap between the push rod pin end and the contact area inside the new master cylinder. I could not find a way to do this. There did not appear to be any adjustments designed to this pin. I also researched online to see if I was missing something, and could not find any information, videos or instructions on adjusting this pin. So, this suggestion turned out to be not applicable to a 1993 Chevy C1500. You would think that a brake system manufacturer would know this. 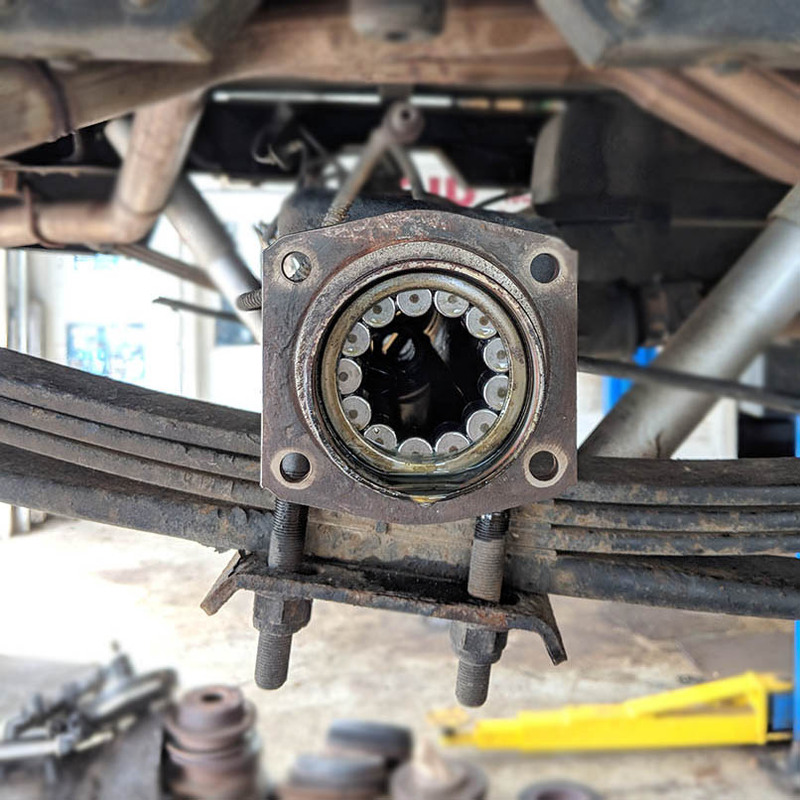 July 18, 2018 – The “Firm Feel” SSBC master cylinder shown removed from the 2 mounting studs on the brake booster revealing the push rod pin. The pin will come out, but there does not appear to be any adjustment available in this particular model/design. 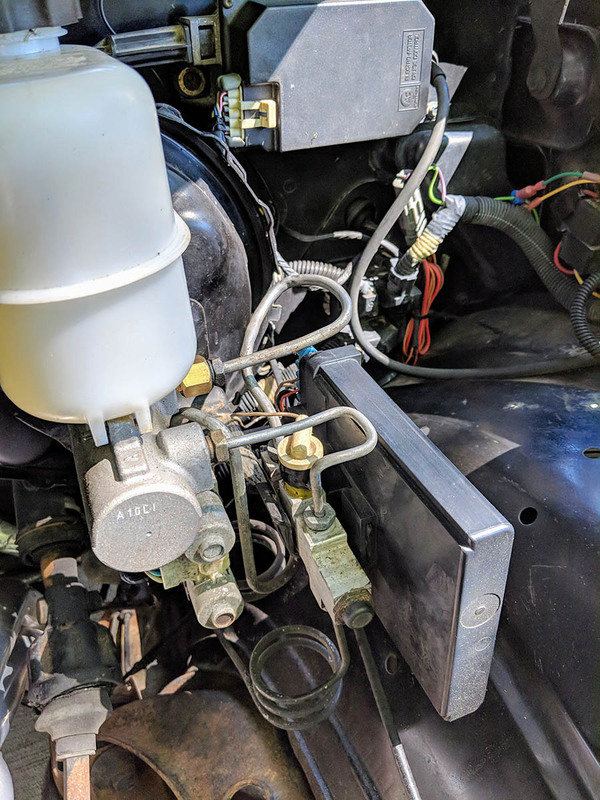 Here is how SSBC and their various online vendors describe the SSBC A0463 “Firm Feel” master cylinder. Does not meet advertised expectations. 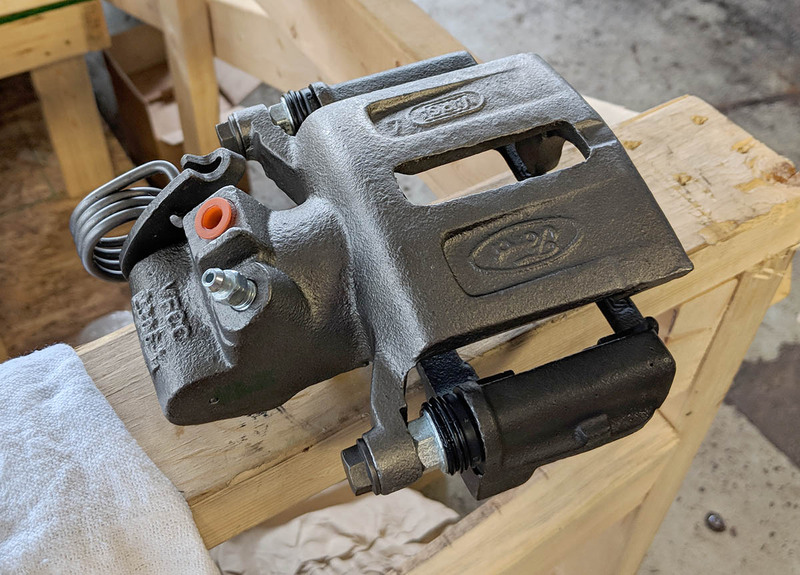 After everything I’ve described above, I would still call my brakes “mushy” and not anywhere near “firm feel.” There is little or no improvement in the pedal feel and responsiveness over the stock OEM master cylinder. 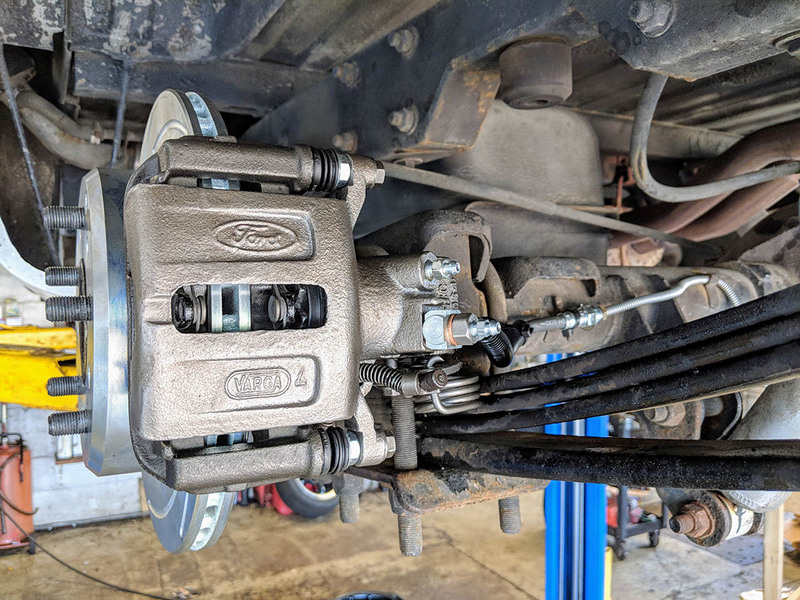 The new rear disc brakes and front calipers do work better than the original drum brakes, stopping more firmly, and in a straight line, however, the pedal feel is not what I expected nor what I would call “firm”. I need to push the brake pedal way too far to make the brakes work and they engage more slowly than I expected. I have reported all of this to SSBC via a couple detailed emails, but have received no calls or responses to date. I am not impressed with SSBC from a customer experience perspective. SSBC may make a good product or kit for my specific year and model of truck, but they made many mistakes in the order and project process. I felt like a small fish dealing with a company that viewed me more as an annoyance, rather than as a valued new customer, who might influence more people to become SSBC customers. They were happy to take my money but were not able to deliver appropriate value for what I spent. I would not recommend the SSBC solution and kit unless one is prepared to deal with all of the disappointments, mistakes, poor communication, and unmet expectations. You’ll need a ton of patience and perseverance. If you can find an alternative company and product/solution, I would recommend you try them for the chance of an improved experience and final outcome. © 2015 1993ChevyPickup.com - All Rights Reserved.